So, that wasn’t the last you’re going to hear about the kitchen at the 10th flip. :) And now that you’ve seen what the 10th flip looks like, I think it might be a bit easier to see where we’re going with the kitchen plans. 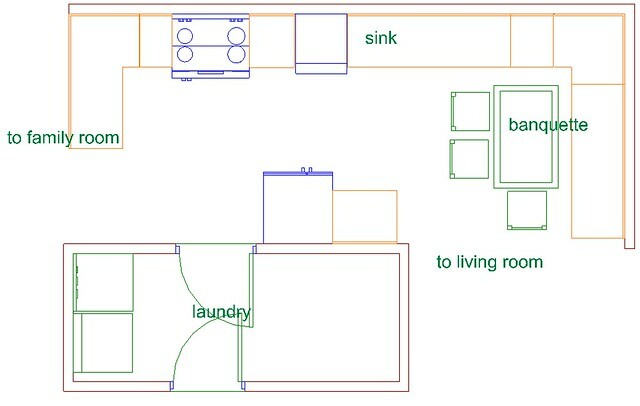 Thanks to all of your feedback, and Sarah’s excellent suggestion of a banquette, I came up with a few new options for the kitchen floor plan (plus one that I really like but doesn’t work due to space constraints). Spoiler alert: I’ve already chosen a layout, but I still thought it would be fun to show you guys all of the options we were considering. I hope you agree! I like this option a lot, because it’s a space dedicated solely to dining. 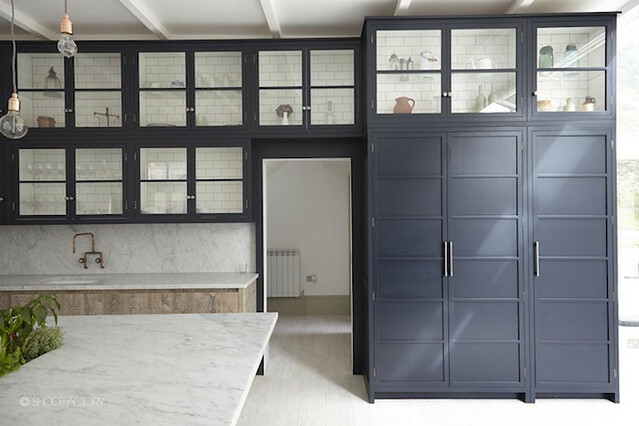 However, that might be a negative in a kitchen that could be perceived as being short on storage/counter space? 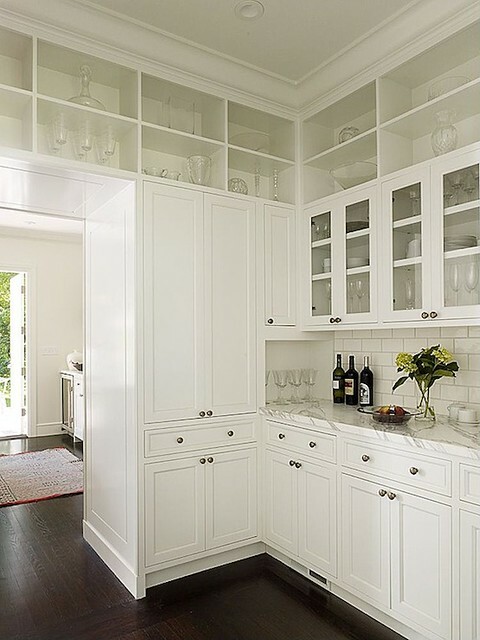 With this option, we’d have room to add a small counter area by the door to the laundry room – a wine fridge, kind of a beverage station area. Ooh, and we’re changing the swing of the laundry room door like many of you suggested! 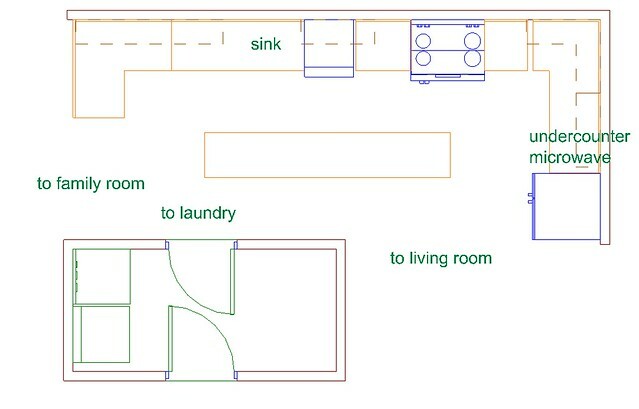 This floor plan was my original thought, since the kitchen needed an eating area and a true island isn’t really an option due to the kitchen’s dimensions. The bar stools would sit on the far side of the breakfast bar (the family room side), which is actually a step down from the kitchen (the family room was originally an attached garage, but a free-standing garage has since been built on the property and the original garage was converted to living space). 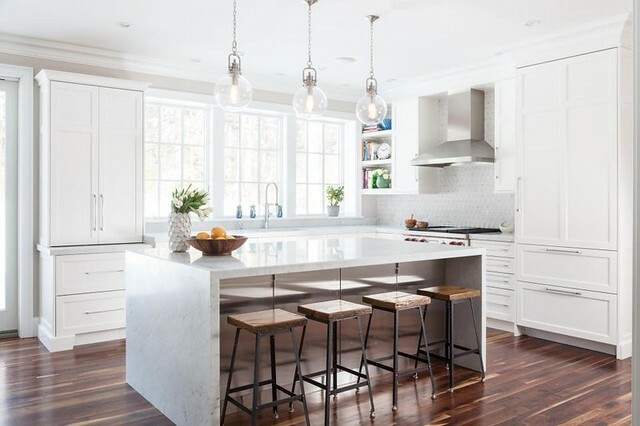 The breakfast bar would be counter height, but due to the difference in flooring heights you would actually need to use bar height bar stools at the counter. Does that make sense? It would be very similar to the setup below (and we could extend the cabinetry like is shown here so that the cabinets touch the family room floor, except it would be a peninsula instead of an island. Oh, and I’m thinking of doing a surface-mount door (like a barn door)! That could be fun. Well, hello there! 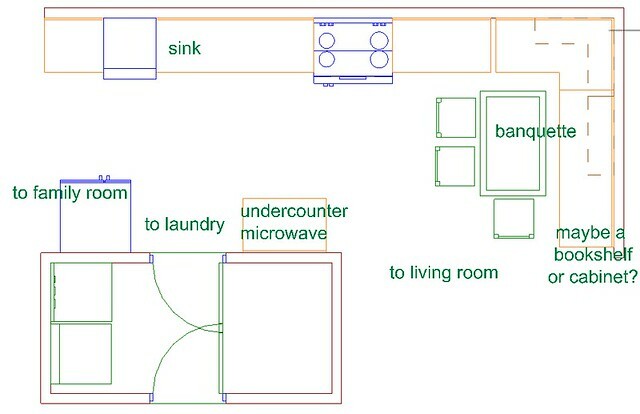 I don’t know why this option didn’t occur to me sooner, but I think it addresses some of the concerns that people had with the original kitchen plan. 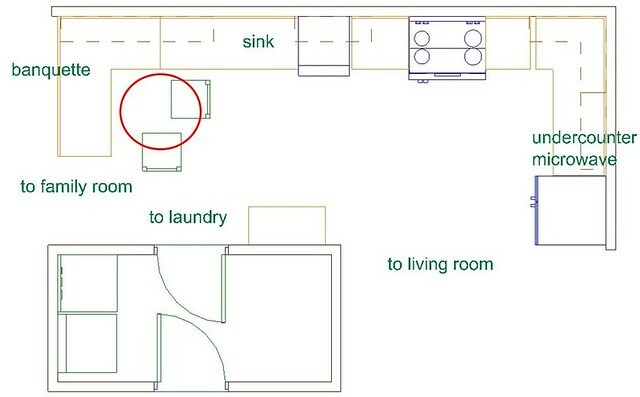 For example, there’s now a lot of room for seating, the kitchen and family room would really flow into one another without any division, and the fridge is now next to the family room. This one was interesting to me since it provides so many options for seating. But, in the end, I think it made the kitchen kind of cramped, which is definitely something I wanted to avoid. So out of all of those options, which layout do you think we chose?? Option 2!! Did you see that one coming? I thought for sure we’d choose Option 3 – for quite some time that was the one I was leaning towards. But, in the end, I became concerned that while it may be something I would like, it might not appeal to everyone. Some people may walk in and be like, “what am I supposed to do with this thing?”, or “my great aunt Edna’s table won’t fit here”, or “I’d rather have more cabinet space” . . . or something like that. I’m not 100% sure of our decision, but I don’t think I ever would be, so we had to make our best guess and move forward. Hopefully we made the right choice! A good safe bet for any buyer. Keep it Simple, right? It will all look great. I think the option you chose will work, but I really want #1. The sliding barn doors work wonderfully, my mother’s house has them for bathroom entrances. Thanks for sharing! We have a breakfast/lunch bar in our kitchen and we use it just about every day. It comes in handy when you’re in a rush and you just plop down on one of the stools and start grubbin. I think you will really enjoy the island once it is installed and ready to use. 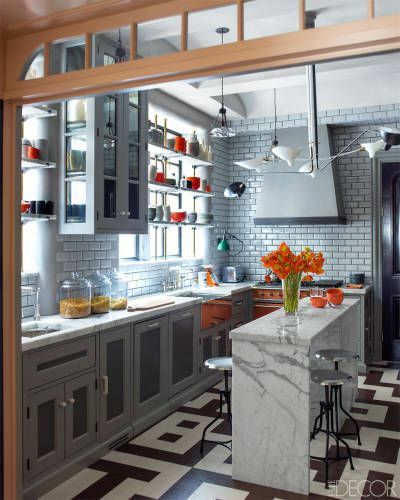 Smartest choice I think – you can never have too much counter space!! Just a heads-up: when we also made a peninsula overhang a lowered family room, I needed stools with higher seats to compensate for the steps. After months of searching, I realised that stools come in two heights, bar or counter, and so I had to get them custom built, not a budget-friendly option at all! 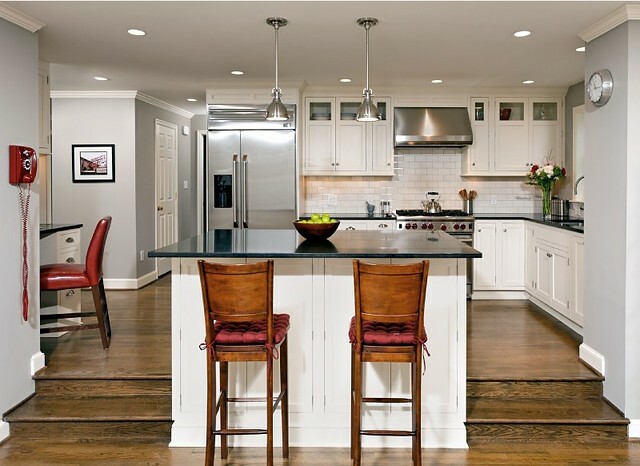 (If you look at the Virginia Kitchen photo, you’ll see that the stool seats would bring the counter close to chest height for adults). Probably not too much of a concern for you since you’re not going to be living there but I wanted to make your readers aware. Hi! Thanks for bringing that up – we’ve already measured and bar height stools will work here, thank goodness! :) Our step down isn’t as dramatic as the one pictured. We got lucky! These are beautiful choices. 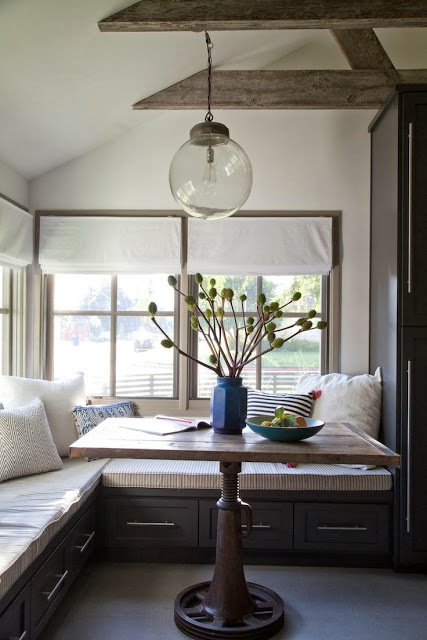 I would love to have a booth table in my kitchen too. I think it would give it a cozy feeling. You’ll have to keep us updated on your results! I agree that option 2 is the most neutral and would suit a bigger group of buyers. Also, the family room looks very large, so why couldn’t someone have a round table with four chairs in one of the corners to be able to eat in a more causal environment? Love your blog and seeing the change process. I was kind of thinking that, too! If I lived there I think that’s what we would do. I like option 2 and 3 the best. The others all had something in front of the sink and you LIVE there when you’re in the kitchen. You picked a good one.